Bull kelp, or bladder kelp is the fastest growing seaweed in the world. It can grow up to 10 feet (3 m) in one summer. Next time your mom thinks you’re growing too fast, tell her it could be a lot worse! Its long stalk has a floating bulb at one end with blades coming out of it. The “holdfast” is at the other end to attach it to a surface. Underwater forests of kelp protect many marine creatures, including crabs. You’re more apt to find bull kelp on open beaches where it has washed in, and not so much in bays. We have the biggest moon snails in the world here in the Salish Sea. They like to eat clams and mussels. About the size of a baseball or a little larger, they have a beautiful spiral shell. You might find what looks like a piece of a sandy inner tube or maybe a large round gasket off a piece of machinery on the beach. That’s the egg case from a moon snail, and needs to be left undisturbed. The largest octopus in the world, Octopus dofleini, lives in the Salish Sea. It can grow to as much as one hundred pounds. It has eight arms, or tentacles, large eyes, a beak, and it uses “jet propulsion” to move itself around. Besides their jet propulsion to escape predators, they can also spread an inky fluid to hid themselves and confuse their predators. Very seldom will you see one on a Salish Sea beach. They’re very shy and like deep water. One of the problems in keeping them in an aquarium is that they are escape artists! 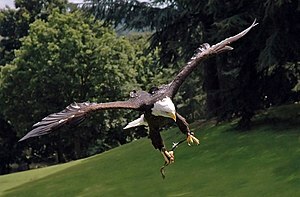 Bald eagles are probably the most famous bird in our country because they are our national bird. They build the largest nest of any bird in North America. The nests can weigh up to one ton! Bald eagles like areas near large bodies of water and tall old trees, so the Salish Sea region has always been a favorite hangout for them. They mainly eat fish, but they’re not picky. They were once endangered, but because people have been looking out for them, they have been taken off the endangered list. More kinds of sea stars live along the Northwest Coast than anywhere else in the world. Some people call them “starfish,” but they’re not fish. Most sea stars have five rays, or arms, but some species have more. If one of those rays breaks off, another one will grow in its place. Sea stars have hundreds of elastic-like “tube feet” on their undersides. Each foot has a tiny suction-cup structure that helps it hang on tightly to a surface. You’re apt to see a sea star on a piling at low tide if it has crawled up to lunch on barnacles or mussels.